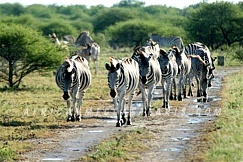 Nxai Pan National Park is located on the north eastern part of Botswana specifically at the northern periphery of the ancient Makgadikgadi basin. 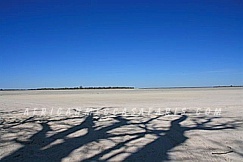 Thousands of years back, Nxai Pan, Lake Ngami, Xau, Mababe Depression, Ntwetwe Pan, Sua Pan and the Okavango Delta were all a collective part of the enormous Makgadikgadi lake which is now dried up. 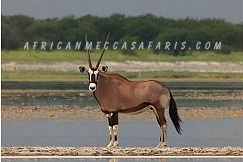 This African safari park in Botswana covered about 2578 sq. km in 1992 when it was officially declared as a national park from its original reserve designation serving an area of 1676 sq. km in 1970 with the now an extension inclusion of Baines’s Baobabs area. To this day, the Baines’s Baobabs remained painted as they were over 150 years ago and continue to be one of the main attractions of the park and serves as an excellent Botswana safari destination for the artists, celebrities, royals such as Prince Charles who have painted there. 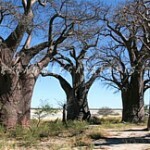 The Baines’s Baobabs were named after Thomas Baines who painted them in May 1862. 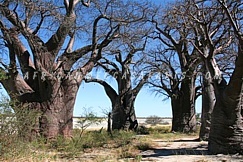 The Nxai Pan and Kgama-Kgama Pan at the northeast, and Baines' Baobabs and Kudiakam Pan to the south constitute the Nxai Pan National Park. 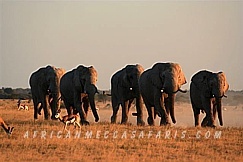 The Nxai Pan, a water basin located approximately less than 3 kilometres from the main access point of the national park is the core point of flora and fauna experiences within Nxai Pan National Park, - a perfect place to start your Nxai game viewing safari in Africa. It is embedded at the middle of the grassy terrain of the park spotted with bunches of umbrella thorn trees. The national park is speckled with fossil pans that are watered in the rainy season that serve as water catch basins. The park is matted with green grasses and tattooed with islets of acacia trees and mopane woodland in the north. The acacia islets that dot the park serve as rest and shade havens of the various animals across the park that makes for a startling Botswana safari experience. At the periphery of the pan, the sand dunes and clayey soils are what made up the Nxai Pan. The mats of grasses contributed to the sheer beauty of the wilds while serving as grazing area for the animals specifically the springbok that aggregate in the park during the rainy season making it a perfect Africa safari photographic opportunity. 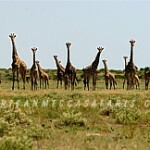 The Nxai National Park is thickly coated with sweet grass and islands of thorny Acacias, Mopane and Baobab trees. Baobabs can live for over 4,000 years, at 25 metres high with a circumference of 30 metres. Rainy season in the park grows fantastic brumsvigia lilies that add breath taking beauty to the flora part of your African safari. The park boast of leopard, honey badger, lion, cheetah, spotted and elusive brown hyenas, gemsbok, zebra, giraffe, kudu, hartebeest, black-backed jackal, rare wild dogs, bat-eared fox, impala, hartebeest and many more. 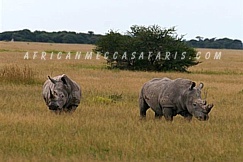 Occasionally, rhinos have also been sighted but a much rare occurrence. An extraordinary scene at Nxai is the presence of the springbok and impala that otherwise do not cohabit because of different habitat requirement. The park has over 200 species of resident and migratory birds in the heavens of Nxai that include rollers, secretary bird, bee eaters, korhaan, kestrel, pale chanting goshawk, red billed francolins and many. 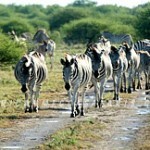 The dynamic ecosystem makes the park a discerning and an offbeat destination for your Botswana safari in Africa. November to April which is the wet summer season changes the dry lands into a paradise filled with explosions of robust, green and luscious grasslands renewing the park large concentration of wildlife. 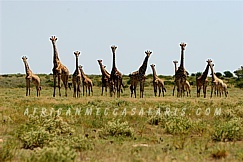 Game viewing is excellent at this time of the year with treats of gargantuan herds of migratory zebras and its baby droppings, wildebeest, giraffe and other plains game attracting predators such as lion, cheetah, jackal and both spotted, brown hyena, wild dog and the elusive leopard. This is a perfect time for a Nxai Pan safari. The dry winter season that is May to October dries much of Nxai. During this time, herds of animals migrate to look for water and better pasture, and Boteti River being of the water magnets attracting wildlife to its banks. 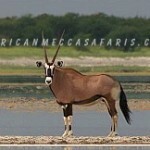 Nxai Pan safari activities include game drives, historical tours to Baines’s Baobabs and nature walks around the park. The game drives to the interiors of the park gives you an unrivaled experience with natural beauty and wildlife. The safari drive gives you opportunity to come at close range with predators that dominate the wilderness of the park and other plains game residents. Historical tours and nature walks at Nxai are an exhilarating African safari activity that brings you to the famous Baines’s Baobabs that have been there centuries ago and are still there to this day without so much a change. In the nature walk, you will have the opportunity to smell, observe, touch, and listen to sounds of the wilderness. The Nxai Pan safari would probably be one of your most rewarding experiences with nature. You will witness the magnetism and allure of the park untainted by massive human intrusion. 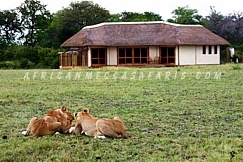 The Nxai Pan is undoubtedly a seasoned Africa safari park, and with careful safari planning offers a captivating and life changing travel Eden for any nature lover.